This 120-verse epic was my musical present to Jacob Berendes on his 19th birthday. The story tells of one Jake Berendes, a youth who on his birthday is taken captive in his own home by a bunch of freaks who force him to party. But the best way, Scully, to find what it's about, is to read the lyrics. It's got action, intruigue, tepid romance, hot beats, funny cars, and The Free Software Song. How can you go wrong? I wrote the song on July 13 and 14, 1998; recorded it on the 15th; and sent it off to Jake on the 16th, his birthday. 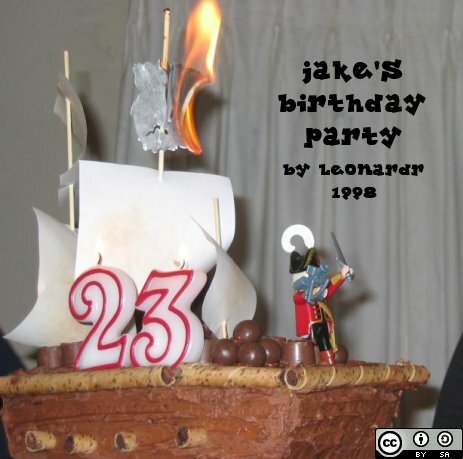 You can now listen to an MP3 of Jake's Birthday Party. If you're insane. It's about 33 megabytes. There's also a much smaller MP3 of the drum loop I used. You can also view the rather weird and superflous guide to JBP, which I don't know why I wrote it or why I wrote it like a guide to some old Icelandic sagas in English translation. Also includes the JBP FAQ! This document (source) is part of Crummy, the webspace of Leonard Richardson (contact information). It was last modified on Sunday, August 19 2007, 04:14:13 Nowhere Standard Time and last built on Thursday, April 25 2019, 12:00:01 Nowhere Standard Time.